It is known as Daylight Savings Time (DST) and it is the annual changing of our time in an attempt to acquire an extra hour of daylight. Confused as to why? Well plenty of us are. Wipe the sleep out of your eyes and I will try to make some sense of it. 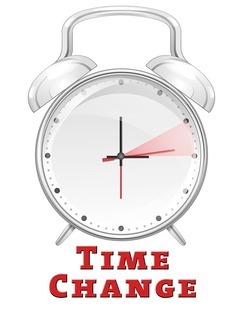 Our regular time is referred to as Standard Time but in the spring we move our clocks ahead one hour at 2:00 AM on the second Sunday in March thus throwing ourselves into a new mode of time known as Daylight Savings Time or DST. Then the first Sunday in November we put our clocks back one hour to place us once again back into Standard Time. Yeah kind of like time travel but we only move one hour in either direction.Some people love the DST time change and others hate it. Statistics are contradictory with some areas showing a positive benefit from the time change and other areas showing it as detrimental. When is Daylight Savings Time? Does it fall on the same day each year? In Canada and throughout the majority of the United States our clocks change on the 2nd Sunday in March and the First Sunday in November. To add some confusion to the mix it is important to note that some time zones in the U.S. adjust their clocks at a different times than the others. In the U.K. they change their clocks on the last Sunday in March and the last Sunday in October. Why do we change our time? The time change has been enacted mainly as a way to conserve energy related resources so largely for economical reasons. It is presumed that we will use less electricity and other energy sources by utilizing DST. The second reasoning is that we will have more daylight hours for the pursuit of our past times. Do I get to sleep in or do I lose an hours sleep? In the spring you lose an hours sleep while in the fall you get to sleep in an extra hour. Do we set our clock forward or backward? Which direction goes when? This is a simple phrase to help you remember which direction to set the clock for Daylight Savings Time and the return to Standard Time. So is the Annual Time Change a Good Thing? Daylight Savings Time was first introduced in Germany and Austria-Hungary back on April 30, 1916 as a means of conserving coal resources. Newfoundland, Great Britain, and Russia initiated a system of DST in 1917, while the United States as well as some areas within Canada joined into the time change program in 1918. There are still locations within Canada, the United States, and other areas around the globe which have exempted themselves from the time change. Although supporters of the Daylight Savings Program largely use economics for the main reasoning behind the continued annual time change, statistics are mixed. In some areas there is a higher incidence of electrical use. Indiana is one of the areas where studies show a higher energy use due the introduction of DST in their area. Overall there is believed to be a 1% reduction in electrical use across the United States. New Zealand also enjoys a reduction in energy use while in Japan and Australia studies indicate there is an increase in energy resources due the time change. Great Britain is still undecided as to whether the time change is a detriment or a benefit. The time change may also be somewhat hazardous to your health. Early morning crashes are reduced shortly after Daylight Savings Time goes into effect but in the days after the Autumn resetting of the clocks there are considerably more car accidents. Pedestrians are 3 times more likely to be killed around the 6 p.m. rush hour within the two weeks after the switch back to Standard Time than they are in the month preceding the November time change. Ouch.